Thank you for using Foldit in your classroom! These instructions will assist you in setting up your students to play Foldit. The following are instructions for setting up a classroom to play Foldit's tutorial puzzles. 1. First, ask your students to create their own Foldit accounts using a specific naming convention set by you. For example, first two letters of first name followed by first three letters of last name and the year. This will allow you to easily identify and track each student. 2. Next, create a private group for your class. Choose a title, description, and under Membership requests select Moderated and click Save. You can give your students the URL for the group page and tell them to click "Request Membership" once they have created and logged into their Foldit account. You will then be able to approve them as members of the group by clicking "Manage Group" from the Group page. This will allow you to keep track of your students within the game so you can easily access their profiles and view their achievements. 3. Be sure your students are familiar with the Community Rules before launching the game. This will help them understand Foldit etiquette, especially when using global chat. Failing to follow the rules may result in a warning, or a ban from our moderators in extreme cases. "Disable non-group chat" is an option that could be used if you want your class players to only have access to group chat (and is strongly recommended). Be sure to restart the client to make sure these changes take effect! 4. We have made this page to help students! Feel free to share it with your class. The following represents a list of recommendations for using Foldit with your students. Foldit is a game about learning and scientific discovery. Enjoy the experience and have fun! Play Foldit and familiarize yourself with the game prior to assigning work for your class. Be present in-chat to answer questions and provide guidance while your students are playing, especially for Middle School and High School students. We do not recommend requiring your students to obtain a global rank. This takes a lot of effort and may cause your students to skip over the tutorial puzzles. 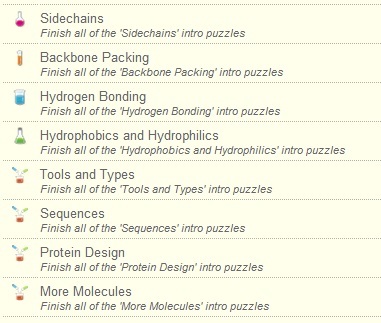 Completing all 32 introduction puzzles can require a lot of time and effort, especially for Middle School students. Try assigning a subset of introduction puzzles instead. Please note you can only assign a sequential subset of puzzles, as they build upon each other and unlock as you complete them. The in-game screenshot button blocks usernames, so this is not suitable for turn-in projects. Instead, you may have your students print a copy of their profile page for you to verify their progress. In some cases, Foldit moderators may request your presence to communicate important information regarding classroom behavior or the game itself. If this request is made, please come on into global chat. Moderators are here to help make Foldit a fun and educational environment for your classroom and the broader Foldit community! If you have a unique case, or just need some extra help, please contact the Center for Game Science for further assistance.